Dolores Park is located in San Francisco, and is pictured above. Matt Mahan reports that on Sunday, October 25th, he spent the day in Dolores Park, talking to strangers about politics. Mahan serves on the Board of Directors of the Silicon Valley Leadership Group. He is also President and CEO of Brigade.com, which claims that "democracy starts when you take a stand." 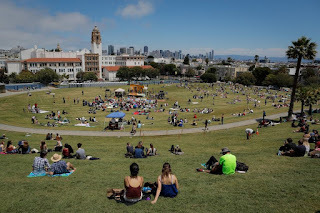 Mahan's report on his activities in Dolores Park appeared as an "Open Forum" column in the Thursday, October 29, 2015 edition of the San Francisco Chronicle. 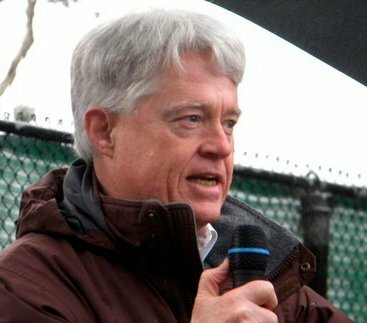 Mahan believes that we are living in a time of "democratic doldrums," and that causative factors include: "the outsize influence of money; the fact that information is not sufficiently accessible, consumable or actionable; and a lack of transparency and tools to create feedback between voters and elected representatives." Brigade, Mahan's company, is his idea of how to fight off the doldrums. It is a larger scale version of Civinomics, the Santa Cruz-based effort to improve civic participation by providing a place where people can record their political views, so others can see them. Brigade, which ties directly to Facebook, is based on the same concept, and Mahan suggests that Brigade, and similar efforts, will make it possible to "leverage the Internet to rebuild local relationships and create a new culture around civic participation." It is my view that democracy does not start when "you take a stand" by posting your opinion on some issue on an internet site. Democracy begins when real flesh and blood individuals join together in a serious and organized way to force the political system to deliver the actions that the majority of the people want. Various tools are available to help accomplish the organizing (including tools based on internet communication), but democracy is not accomplished by "taking a stand," if that means "expressing an opinion." The essential aim of democratic politics is to find an effective way to force elected officials do what the majority wants. That objective can be accomplished by (1) persuading current elected officials to carry out actions that the majority demands; (2) by replacing, at the next available election, any elected representatives who are not responsive to what the majority wants; (3) by recalling recalcitrant elected officials who refuse to do what the majority wants; (4) by requiring a referendum vote on measures enacted by elected officials who are out of touch with what the majority wants; and (5) by directly legislating through the initiative process. You can't put in an order for "democracy" the way you can buy a book from Amazon. You can't click on what you want and expect to have it delivered within the week. Democracy is actually a matter of mobilizing the power of ordinary people to make their government, and their governmental representatives, do what the majority desires. It's not that easy, either. Sure, we can all "take a stand" on the Internet; we can sign an online petition; we can "Like" a cause; and we can "Share" our status. None of that hurts. But please don't believe that we can achieve any kind of effective democratic politics over the Internet. On the streets, yes! In Dolores Park, sure! But real contact with real people. And not just once! That being said, I'm cautious about demanding that politicians do "what the majority demands," especially relying on voting to oust unpopular representatives and change laws through the initiative process. In this era of ubiquitous propaganda and media influence, what the majority demands may not be the best course of action for the common good. When public opinion is largely influenced and dominated by corporate control of information access, majority opinion is increasingly narrowed to serve elite agendas. When corporate interests can buy votes through pay per signature initiatives, the deliberative representative legislative process is abrogated to moneyed influence and control. Rather than reliance on voting, democracy functions at the local level in day to day involvement with the process of government. We have numerous opportunities to take an active role working with our representatives, through letters, phone calls, email, personal meetings, public hearings and public comment periods at regular meetings. There is no excuse for waiting until the next election to express opinions, provide relevant testimony and engage directly with government representatives and staff. If the United State government is to be truly "of the people, by the people and for the people," then "the people" have an obligation to take part in its formation and management. There are many internet tools to help in this process, but they can never substitute for direct face to face involvement in our government. I am in complete agreement with you on this important topic of how to do democracy -- and it is not on the internet, clicking "likes." Yes, the internet is a very appropriate tool for research and communication. But social media is not democracy in action. You have described perfectly several campaigns on which I have worked (some successful some not). The successful campaigns have all been about people getting together face-to-face, discussing the issue, how to engage other like-minded folks, how to inform ourselves, how to most effectively share that information, and how and when to best approach decision-makers. I am glad you penned this particular essay and I intend to share its contents with others!